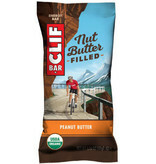 Clif Bar's Nut Butter Filled Energy Bar is delicious and filled with creamy nut butter. 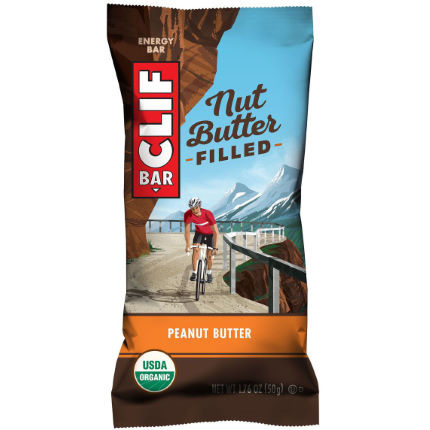 Perfect for popping in your bag or jersey pocket for an energy boost as and when you need, this bar also contains 7 grams of plant-based proteins. Completely organic and made from wholesome ingredients, this bar is moist and easily digested, and much of the 11 grams of fat comes from healthy nut butters. Ingredients: Organic peanut butter, organic oat flour, organic rolled oats, organic brown rice syrup, organic date paste, organic cane syrup, organic tapioca syrup, organic pea protein, organic rice starch, organic high oleic sunflower oil, organic palm oil, organic peanut flour, organic dried cane syrup, organic rice flour, organic brown rice protein, natural flavours, vegetable glycerin, organic peanuts, sea salt, sunflower lecithin, mixed tocopherols (antioxidant). Allergy information: Contains peanuts. May contain soy, wheat, tree nuts, and traces of milk.